Press, Festival or Booking questions e-mail us. Click on the badge below to visit our Facebook page which has more news and information about the film. Use these links to Learn More About the Global Water Crisis - yes, water privatization is going on right here in the U.S.! If you would like to suggest a link, e-mail us! Find out how you can help bring clean and safe water to villages & cities, that, like those depicted in the film EVEN THE RAIN, do not have access to this staple of life! water.org. *To attend these screenings you must be a voting member of the Academy of Motion Picture Arts & Sciences. RSVP required. For details & tickets click here. January 2011 dates to be announced. 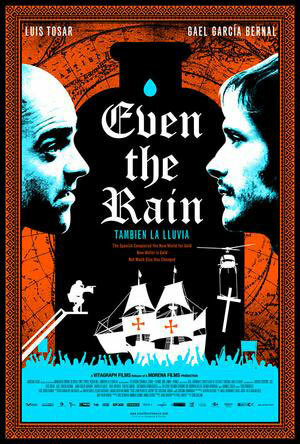 Luis Tosar as Costas the producer and Gael Garcia Bernal as Sebastian the director in EVEN THE RAIN (Tambien La Lluvia). Gael Garcia Bernal as Sebastian the director of an historical epic on Christopher Columbus in EVEN THE RAIN (Tambien La Lluvia) Credit: (c) 2010 Moreno Films Local children in Cochabamba, Bolivia are cast as 15th century indigenous people in the film being made by Sebastian (Gael Garcia Bernal) & Costa (Luis Tosar) in EVEN THE RAIN (Tambien La Lluvia). (Left) Belen is the daughter of the town's protest leader against government privatization of water. Credit: (c) 2010 Moreno Films. Daniel (Carlos Aduviri) joins the cast of the film within a film in EVEN THE RAIN (Tambien La Lluvia), but when he isn't acting, he is leading protests against the injustices of the government against the indigenous community. Credit: (c) 2010 Moreno Films. 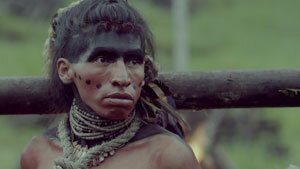 In the film within a film in EVEN THE RAIN (Tambien La Lluvia), the production's biggest scene depicts the natives of the New World burned on crosses by 15th century Spanards. 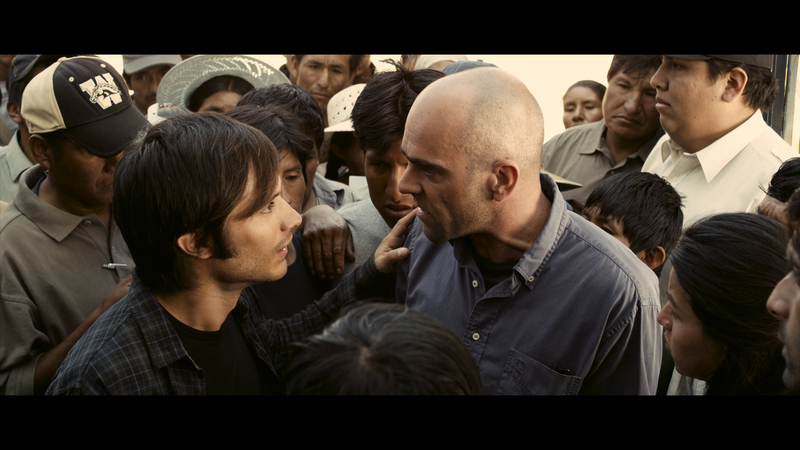 When Sebastian (Gael Garcia Bernal) and Costa (Luis Tosar) see the mob waiting to be seen at their open casting call, they argue over how to proceed in EVEN THE RAIN. Credit: (c) 2010 Moreno Films. Gael Garcia Bernal as Sebastian, an idealistic film director on shoot in Cochabamba Bolivia when the 2000 Water Wars breaks out. Credit: (c) 2010 Moreno Films. 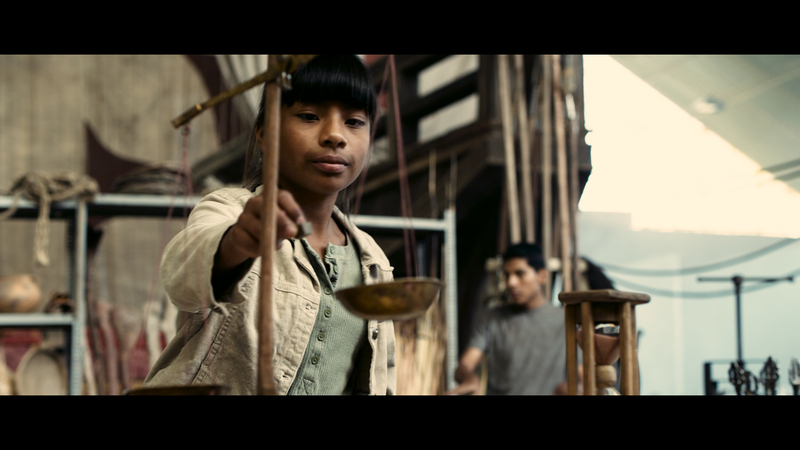 Belen plays with the gold scale, a prop from the film she is actng in in EVEN THE RAIN. Credit: (c) 2010 Moreno Films. Costa says some regrettable things in English in front of Daniel, one of the Bolivian locals portraying a 16th century warrior in EVEN THE RAIN. Credit: (c) 2010 Moreno Films. 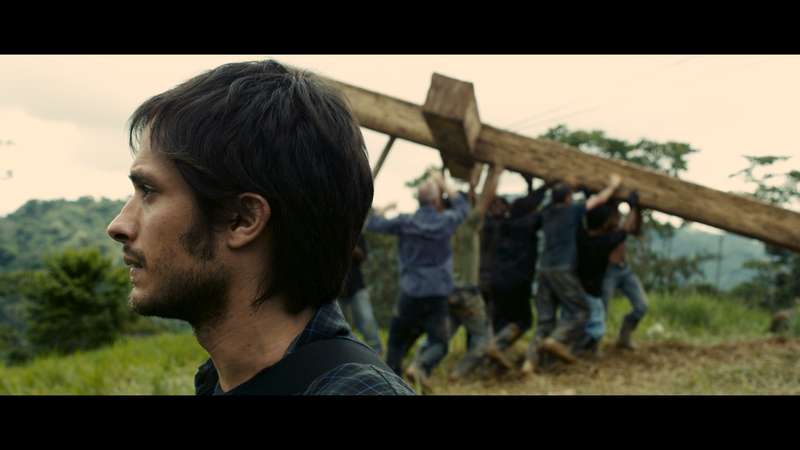 Costa (Luis Tosar) tries to keep a full blown war rom errupting between his 'extras' and the police in EVEN THE RAIN. Credit: (c) 2010 Moreno Films. Daniel (Carlos Aduviri) protests the privatization of his city's water supply by a multi-national company in EVEN THE RAIN. Credit: (c) 2010 Moreno Films. 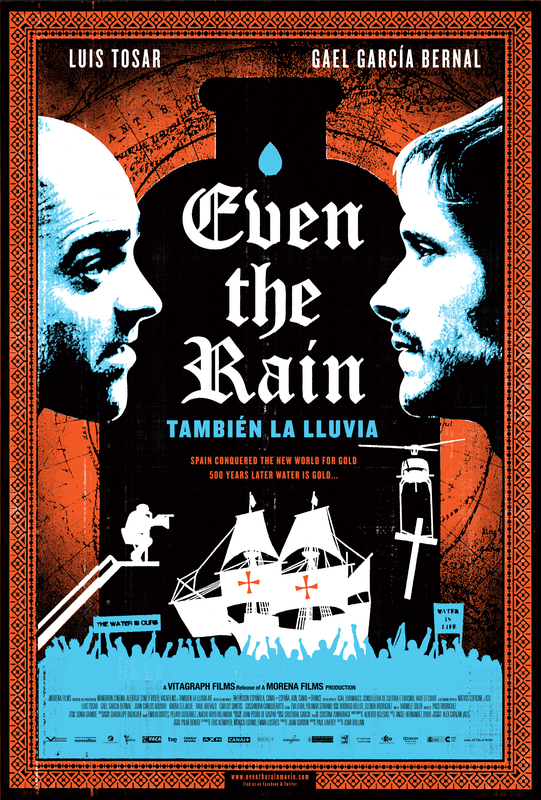 Even the Rain poster designed by Studio Number One. The Water is ours damn it!